Urbana FFA had a fun day at Maple Lane Farm. Farm Day was hosted by the Urbana FFA on May 8 at Maple Lane Farm, owned by Tim and Staci Weller. 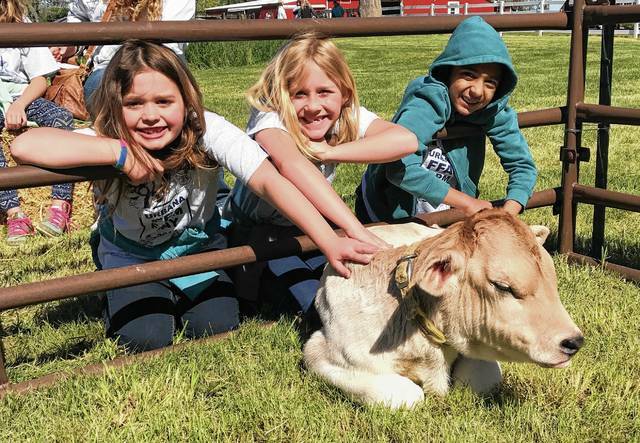 Farm Day is an educational day for all of Urbana City School 1st graders to experience a day on the farm and the different aspects of agriculture. The first half of the 1st graders came at 9 a.m. They spent two-and-a-half hours going to nine different stations to be educated by FFA members, alumni and advisors.The different stations were: plant a seed, how to make ice cream, hay ride, goats, beef cattle, how to milk a cow, chickens & ducks, rabbits, and lastly horse rides. At 11:30 the group broke for lunch as the second half of the first graders arrived. After lunch the 2nd group went through the stations. The 1st graders, parents and teachers all learned a lot and had a great time! Thanks to all the FFA supporters for helping with the event by providing the site, animals, education, food, donations for resources and helping hands. The 1st graders will remember their day on the farm for many years to come! The Backyard Belles and Boys 4-H Club held a meeting on Sunday, June 25, at the home of Zoey and Grady Underwood. The meeting was called to order by President Oliver McGuire. Lauren Underwood led the Pledge of Allegiance, and Tyler Snyder led the 4-H Pledge. Attendance was taken and it was reported that we collected $93.00 at Button Day for Champaign County 4-H. In old business, Oliver McGuire shared that the canoes were reserved for July 15, 2017 at 12:30. Everyone is to meet at the Birch Bark Canoe Livery at 12:00 PM. Everyone was reminded to continue to work on project books. In new business, skill-a-thon dates were given and plans were made to begin working on our club booth for the fair. We then practiced for skill-a-thons. Jackson Underwood motioned to adjourn the meeting, and Essie McGuire seconded it. Our next meeting will be held on Saturday, July 15, 2017, at 6:30 PM, at the home of Andrew and Sarah Lewis. Everyone is to bring a covered dish and his/her project book(s).